Pole banners give you yet another high-quality option for advertising and promotions outdoors. Long a mainstay of schools, museums, and urban promotions, this durable format allows anyone to easily turn any light or utility pole into valuable advertising space. No need to use up space on your wall or on the sidewalk. Advertise events, product and service offers, and much more, right in the line of sight of drivers and pedestrians. 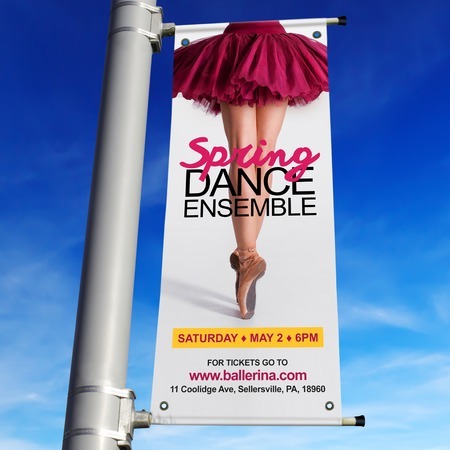 We print on tear and weather-resistant 18 oz, blockout vinyl for street pole banners and 13 oz. vinyl in a matte finish for wall mounted. Print on both sides and choose the size from the pricing calculator to fit your needs, or order a custom size. You can print one perfect for close-up indoor use, long distance line-of-sight promotions outdoors, and anything else in between. Order quantities from 1-50, great for advertising at one street or across an entire city. Add your choice of single or double brackets to easily attach your banner on any pole. Order now and have them ready to be shipped in as soon as 5 business days. Note: Pole banners come preassembled inside the travel bag.